The rijstaffel at Ramayani. For link, see below. Three things you need to know: (a) translated from the Dutch, the word means “rice table;” (b) in order to taste this Indonesian speciality at its best, you should consider traveling to Amsterdam, where rijsttaffel has been popular for several hundred years; (c) the dish, or, more accurately, the presentation of dishes is a blend of Dutch and Indonesian, and not quite native to either place; and (d) for reasons I don’t understand, this appealing combination of Asian food has never found its place in America. 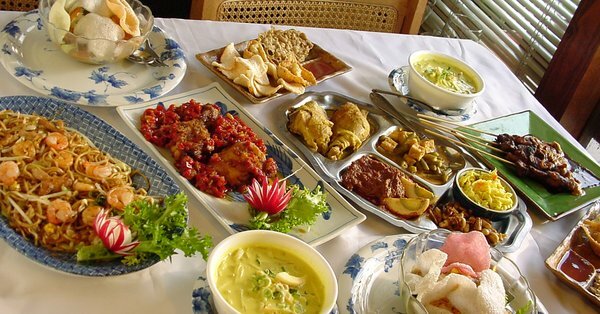 A typical Dutch rijsttaffel usually consists of several dozen small dishes (often, forty dishes is the count), so this is the kind of meal that you’ll want to enjoy with several friends. Beer is your most likely accompaniment: the most popular Indonesian beer is a lager called Bintang, but if you’re dining in Amsterdam, you’ll find a wide range of superior Dutch and German beers just about everywhere. A good rijsttaffel will feature dishes that highlight specific colors, spices, flavors, and textures. At first, the textures may be off-putting as they may run from crunchy to soggy to runny to gelatinous. And the array of colors may overwhelm. Relax–there’s just a bit of everything, and there’s no law that requires that everything be tasted by every person at the table. From Wikipedia, banana leaves, rice, and a meat filling. It’s called lemper. The grilled banana leaves–green in color–are likely to be lemper. Inside, there’s a bit of sticky rice and a meat or fish filling (think in terms of an Asian tamale) with rice in place of cornmeal. Also wrapped: lumpia, which will be familiar as a deep-fried, crispy spring roll. Golden in color, perkedel are a mix of ground meat and mashed potato, fried up so that it looks like a flat meatball. If you are familiar with frikadeller (flat Danish or German meatballs). From Wikipedia, an Indonesian fried rice platter with shredded egg omelette, meat floss, and a pair of spiced meat dishes. And more. 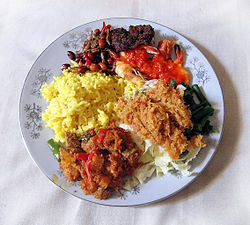 Nasi kuning will be familiar as fried rice, often served on a larger platter surrounded by serundeng (a relish of coconut and spices), urap (cooked vegetable salad, often shredded, also with coconut), balado udang (shrimp in a chili sauce). Sometimes, the rice is served in its own bowl, and these side dishes are served among the many small bowls that fill the rijstaffel. You’re likely to find some flavorful soups and stews, too. Sayur Iodeh is a coconut soup with vegetables (jackfruit, various types of Asian squash, melinjo, and more. Semur is a beef stew in a sweet soy gravy with ginger, onions, garlic and other (generally) familiar spices. Pisang goreng is more of street food, and perhaps, more of a breakfast or lunch snack than a dinner staple, but you’ll often find this sweet dish on the rijstaffel as well. Ayam gurang is fried chicken with special spices. Satay will also be familiar–it’s marinated meat on a thin skewer. There are various curries, some similar to those you would find in an Indian restaurant, some with different spices (a curry is a blend of spices, not a particular spice, so variety should come as no surprise). 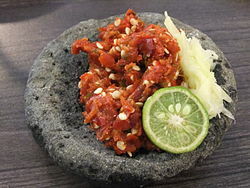 From Wikipedia – Traditional sambal terasi served on stone mortar with garlic and lime. Keep your eyes open for the sambal dishes–the dishes made from peppers of every variety and every degree on the Scoville Scale. Indonesians love their peppers, and it’s not unusual to find several sambals on the buffet, including dishes made with lemon, mango and other fruits, including the (very smelly) durian. Not all sambals contain pepper. Of course, specialties abound. For example, Indonesia Restaurant (see below) features Kepiting mask telor, which is crab served on egg with sweet and sour sauce. And you may find something different, just for the sake of giving a new food a try, as with the same restaurant’s mutton satay. I know it’s difficult to imagine all of this in a single meal (and I’ve named less than half of what you’re likely to find in a rijsttaffel), but as I say, the dishes are small, and all of this is intended to be shared by several people. But do you really need to travel to Amsterdam to enjoy this dining experience?If all of this is sounding a bit like a cross between Indian food and Chinese dim sum, you’re getting the right idea. I wish I could communicate more about the delicate, powerful, varied spicing and “mouth feel” of these dishes–it’s great fun to jump from one dish to a very different one–but you’ll need to fly to Amsterdam or try one of the restaurants below for that experience. A rijsttaffel is not the sort of dish that any reasonable person would prepare for casual dining at home. Indonesia Restaurant – Philadelphia. Choose from one of four different rijsttaffel menus, priced at $15, $17.50 or $20, $25. Hardena/Waroeng Surabaya Restaurant, also in Philly. Very popular. Mie Jakarta – No surprise that some of the best Indonesian food in New York City can be found in the international borough of Queens. Java Indonesian Rijsttafel – This one’s in Park Slope, Brooklyn. Satay Sarinah – A more upscale place in Alexandria, Virginia, outside Washington, DC. Very instructive website. Borobudur – Great place in San Francisco. Very instructive menu online, too. Ramayani Westwood – Los Angeles, California. Unassuming, but a great neighborhood place. For updated information, visit Dutch in America from time to time. And how about the best rijsttafel restaurants in Amsterdam and Europe? Tempo Doeloe Indonesia – Amsterdam. Good detailed menu info here. Check online for latest reviews. Sampurna – Amsterdam. Probably the best choice; consistently great reviews. Kantjil & de Tijger – Amsterdam. Upscale with a varied menu. Temptations abound, but talk the group into joining together for the rijsttafel–you’ll be glad you did! Bali Bali – London, in the West End. Here’s a look at just a few of the rijsttafel dishes served in Amsterdam’s Kantjil & de Tijger restaurant.